My Italian part of my trip is almost over; currently enjoying Trieste. I have been using the train around Italy but when I checked the Trenitalia website to see if a train left from Trieste to Ljubljana it says it does not know of any trains? This does not make sense, surely there must be a train service from Italy to Slovenia? 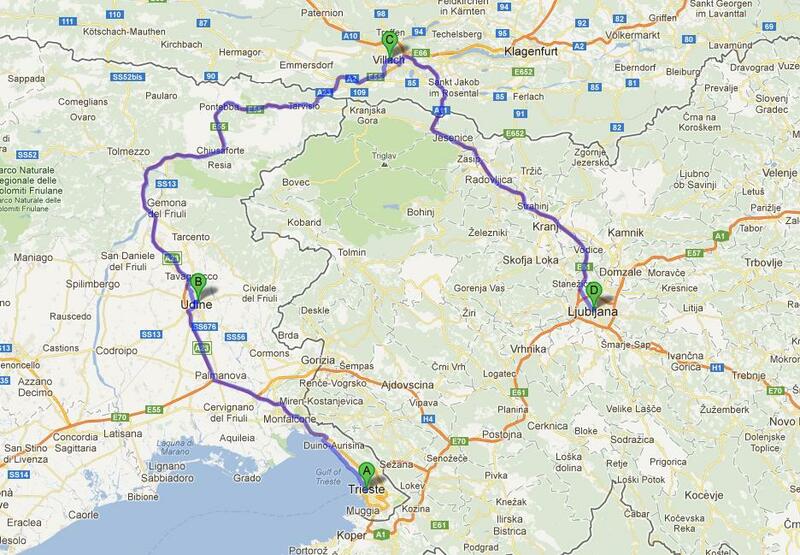 If not does anyone know the best way to get from Trieste to Ljubljana? There is a railways (in fact even several) between Italy and Slovenia, but they only carry freight at the moment. The main reason is that Trenitalia is not an easy company to cooperate with, and the Slovenian railways don't have the money to go on their own (like for example the German and Austrian railways have done) I have travelled from Ljubljana to Trieste when cross border trains were still running, but this was a few years ago. 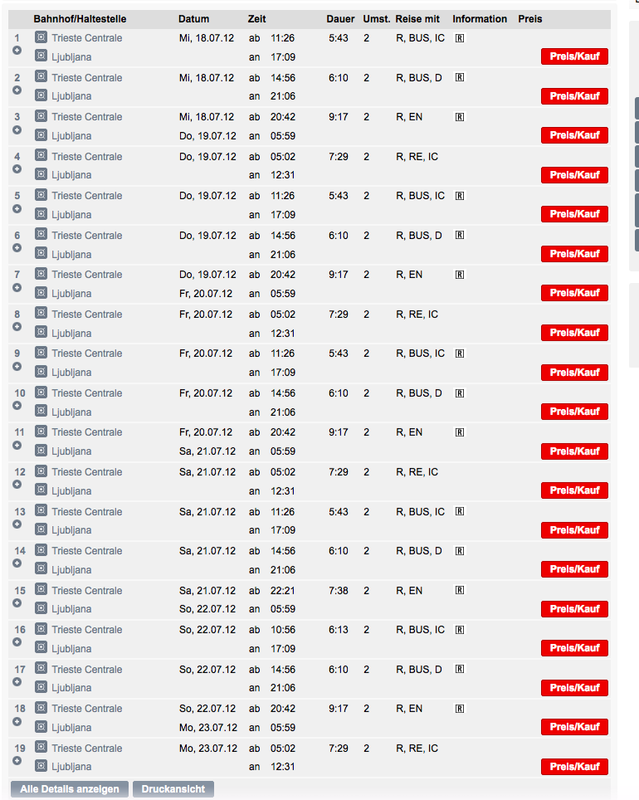 Currently the options to get from Trieste to Ljubljana are: - Direct bus. - Bus to Sezana and train from there. - Tram (it's quite an interesting tram actually) to Vila Oppicina. Taxi to Sezana from there. Then train. www.bahn.de will give you info for trains from Sezana to Ljubljana. www.autostazionetrieste.it has info about buses. You can also go via Gorizia (and walk from the one station to the other) but that's a bit roundabout. Update: Since the last timetable change there is again a train from Vila Opicina (above Trieste) to Ljubljana. So the trip now involves using the tram,bus or a taxi to get to Vila Opicina, where you can now board the train again. Lets hope this improves in the future. Strange as it may seem because of the limited distance, the journey between Trieste and Ljubljana is rather tortuous and complicated, but there surely is a connection between Italy and Slovenia. As you can find in this link, you go to Gorizia by train, then you need to catch a bus or a taxi to reach Nova Gorica in Slovenia, from where you will catch another train to Jesenice and finally to Ljubljana. A different itinerary will take you to Gorizia by train and then to Nova Gorica by bus or taxi, then you take another train to Sezana, hence change to Divaca and finally to Ljubljana. This way you have to catch a series of means of transport, but the whole journey should last only 5 hours. I suppose that you could travel faster if you chose to travel by coach, but I couldn't find reliable information about this. EDIT : I'm sorry, but the correct page disappears whenever I try to link it. It is however to be found on www.reiseauskunft.bahn.de, then fill in the details of your request. Unfortunately, I can't get an immediate price quote. You have to either call them, or use the online form to enter your personal details and then you will get a price quote in a few hours. The alternative, and a longer option, is to take a bus to Koper (about 20km), and then a train from there to Ljubljana. There is actually a train connection between both cities again since September 2018. Surprisingly enough, there is indeed no railway between Italy and Slovenia. One can see that on the map of European railways provided by Interrail that even though the Italian and Slovene railways are very close to each other, they do not connect. While I do not have a definitive reason, it might be because this is a former border of Yugoslavia. An article on Wikipedia on Italy-Yugoslavia relations shows they were quite animated. On the map, we can see that the cities of Gorizia, in Italy and Nova Gorica in Slovenia are pretty close, as well as Trieste is close to Sezana and Koper. One can find on wikitravel a suggestion for a bus between Nova Gorica and Gorizia, a 10 minutes ride. By the way, I am also surprised no one looked at a map when trying to answer this question. Not the answer you're looking for? Browse other questions tagged trains italy slovenia or ask your own question.